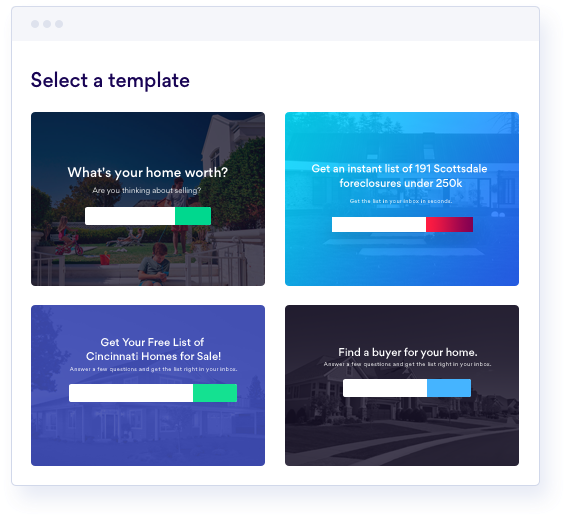 A real estate sales funnel is a set of landing pages that give information about properties or a neighborhood in exchange for user contact information. These funnels are perfect for agents who want to attract buyers looking for detailed property information. 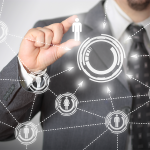 Ultimately, buyer contact information collected from a sales funnel can lead to a sale. The backbone of a successful real estate sales funnel is a robust contact management system with an easily customizable website. Many agents don’t have the time to set this up manually, however. Check out the Real Geeks demo to find out how agents can quickly set up their real estate sales funnel, automate marketing tasks, and nurture leads through the pipeline without any technical expertise. Knowing your market audience is key to creating a custom real estate sales funnel that converts the greatest number of potential buyers to leads. You have to know your ideal client well enough to customize your real estate sales funnel to attract their attention and convert them. A target location is important to funnel creation because real estate sales are dependent on an agent being familiar with the buyers and characteristics of a specific area. You should be aware, as you set up your real estate sales funnel, that you may have multiple target locations. A customer profile should include primary demographic information about potential buyers, including age, income, marital status, interests, habits, purchase behavior, and other factors. For example, your primary buyer might be young married couples with small children on a restricted budget, and your secondary relocation buyer might be an older couple seeking a vacation home. Knowing these factors helps you determine what you incorporate into your funnel. A Google search or chat with your local Chamber of Commerce representative should help you get insight into your buyers’ markets. You can also learn about the best ways to create a customer profile on our website. Your sales funnel should represent your specialty. If you handle commercial or investment properties, then your real estate sales funnel should be customized to address this type of buyer. Make sure that your landing pages convert the right type of lead with the right message. A CRM is a customer relationship manager that helps you track and engage clients with automated emails or texts from the moment of initial contact through the final sale. The right CRM can take some of the heavy communications lifting off your hands with automation tools that nurture leads through the sales funnel, saving you time and money. 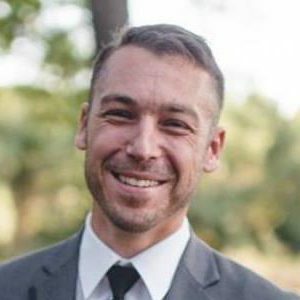 Real Geeks is a full-service CRM and lead generation system that allows real estate agents to set up a website and automated marketing and communications tools to keep leads engaged in the buying process. Real Geeks will also handle Facebook and Google AdWords for agents who are too busy to manage their marketing efforts manually. BoldLeads only allows one agent per ZIP code, so their lead generation advertising efforts through Facebook ads and Google AdWords are focused around making one agent the online star for a local area. BoldLeads sends interested traffic to your funnel landing pages via ads that offer free tools and resources (lead magnets). For agents and teams that need an all-in-one real estate CRM solution, Wise Agent provides robust landing pages that quickly capture leads, moving them through your sales funnel with automated tools. With transaction tracking and management, admins can quickly draw reports and take action based on easy-to-understand data. LionDesk is for the agent or team that is interested in using advanced technology like video emails and video texts to amp up buyer engagement in their real estate sales funnel. 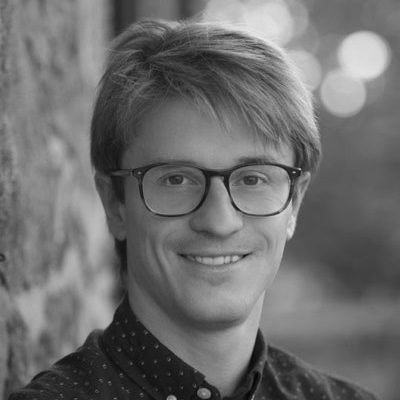 With a CRM designed for the on-the-go agent, LionDesk is ready with auto-responders, email drip marketing campaigns, and text-to-sell options to help enhance and track leads throughout the funnel. Chime is an excellent opportunity for larger agencies and brokers who want a turnkey, full funnel solution for their business. With marketing automation and lead tracking, Chime is slightly more expensive that other CRM options, but also offers more in-depth reporting features. Lead capture magnets are free offers, tools, or resources that draw buyers into a funnel via ads. In exchange for receiving these free offers, they share their contact information, which enters them into the sales funnel. Lead capture magnets are typically placed on landing pages at the top of the funnel, but can be added through the funnel to continue engagement. For many real estate agents, lead magnets are sales reports, buying guides, or property valuation tools. Preparing your lead capture magnet is an important step because a buyer or seller will not wait days while you get your offer ready to send; as soon as a buyer clicks on an ad and submits their contact information, they should receive their lead magnet. Once you get your lead magnet right, remember to check it over every few weeks to update the information. Lead capture magnets are not evergreen, so you have to make sure that the data stays current. Market Report: A market report might include a discussion about local businesses or schools, recent property purchase prices, or the most important features in homes for the area. Sometimes, these reports compare national averages against local averages to give a better picture of the buyer’s market. 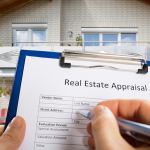 Home Valuation: Sellers often wonder how much their home is worth in the current market. Using a home valuation tool or report as a lead magnet helps attract sellers who are thinking about listing their house. Foreclosed/Investment Properties: Many agents and teams focus on setting up their real estate sales funnel for people searching for foreclosures or investment properties, so this type of lead magnet needs to be about local deals with a possible slant toward fixer-uppers. Buyer’s/Seller’s Guide: This type of lead magnet focuses on helping first-time buyers and sellers through the real estate process with a checklist and helpful hints. As first-time buyers are often confused about the roles and steps of buying a home, this is a good way to build trust. A landing page is a single web page that your traffic is sent to from a dedicated link (most often from an ad). 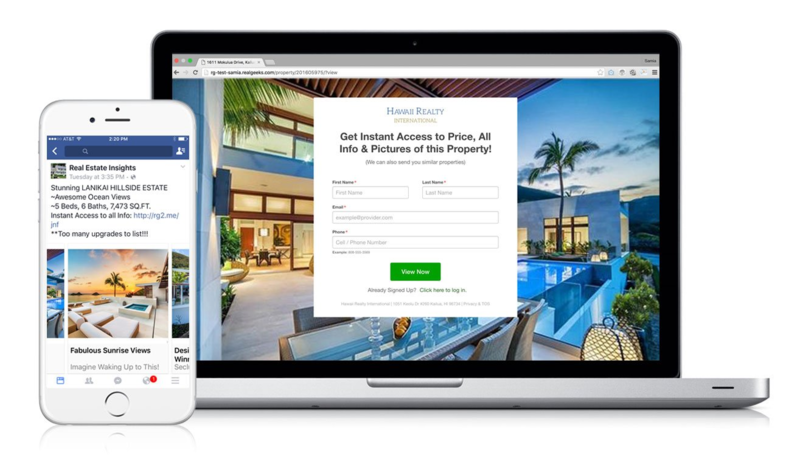 Your landing pages are the welcome mat for your real estate company. Their job is to invite website visitors to leave their contact details via lead capture forms in exchange for lead magnets. Because this is the first impression a buyer will have of your business, it’s important to make sure it is designed to match your brand, messaging, and the buyer’s needs. Most landing pages begin as easy-to-edit templates that give agents the power to customize their branding, logo, images, content, and features without knowledge of coding or extensive time trying to “figure it out.” The best real estate CRMs include drag-and-drop or click-edit boxes that make it quick to customize your landing pages. Automated marketing tools are designed to save you time interacting with and nurturing leads by creating auto-responders and emails triggered automatically by specific actions on your website. It is critical to think about what you want to happen as the result of this engagement and give the recipient clear instructions that move them through the funnel. Auto-responders are triggered by a certain buyer action in the real estate sales funnel. If a website visitor fills out a lead capture form on a landing page to request a lead magnet or creates a search agent, then the CRM should respond with the message set up by the agent to establish contact—while also providing them with the requested lead magnet. Welcome/Introduction: A welcome or introductory auto-responder is the first time that your lead sees a message from you once they enter into your real estate sales funnel. Be warm and think about ways you can move them to the next step in your funnel, such as reaching out with questions on your website or browsing the site for properties that fit their needs. Response to Contact: If a lead asks a question or wants to set up an appointment, your AR should be ready to give them a direct phone number or online calendar link. Preference/Search Criteria: When leads change or add a search criterium, an auto-responder might send them a listing of other properties that meet those criteria or offer an appointment to view a property. Lead Magnet Delivery: Lead magnets are a wonderful way to get people into the real estate sales funnel, and an AR can instantly deliver their report/guide directly to their inbox with recommendations and contact information to follow-up. Follow-Up Request: When a lead returns to the website after a few days or weeks away, an AR is a good way to welcome them back and remind them of your contact information. After Sale: The opportunity to interact with a buyer does not end when the keys are handed over. Creating an after-sale AR with links to social media and review sites can help boost your online footprint. Drip email marketing campaigns focus on keeping the lead involved in the buying process by delivering new information they would be interested in. These include property listings that match certain criteria or letting buyers know about seasonal events, like hurricane preparation tips or back-to-school ideas. A drip marketing campaign is all about keeping the agent in front of the buyer or seller. With the use of smartphones, the ability to send and receive automated SMS texts establishes a communication channel with a potential buyer and answers questions quickly without increasing time commitments for the agent. Simple text responses can set up meetings, respond with hours of availability, or send a welcome introductory message to a buyer. In an increasingly mobile-first world, this is a valuable automation tool. Video is the next big frontier for online marketing. Although a real estate video is great for social media posts, there are so many more ways you can take full advantage the medium. Videos can showcase your testimonials, feature your properties, and welcome new buyers—all of which can be used in your emails, texts, and auto-responders to make your message unforgettable. If you are interested in learning about the different types of videos that work for marketing campaigns, then check out our article about the four types of real estate videos every agent should master. You can learn from the pros how to make the perfect real estate video. Your social media channels are a large part of your online presence and will really be critical in setting up your real estate sales funnel. You should start to review your social media channels now and create regular posts to give visitors a reason and a way to engage. Facebook: Facebook is the place where most people go to engage and ask for recommendations. Creating a Facebook page that represents your brand should include a recent head shot or logo, a welcoming cover photo, and relevant About Us information including phone number, website, awards, and a description about you as a realtor or your agency. Google My Business (GMB): A thriving Google My Business listing will give you an online presence with good search engine rankings for local results. Updated information should include your website URL, company description, phone number, hours, and responses to any reviews left by past clients. LinkedIn: Many real estate agents are found on LinkedIn through their personal profile or their company listing. Because LinkedIn is a professional version of Facebook, your profile should represent all the previously mentioned updates as well as any awards, recognition, or specializations. It’s also possible to secure recommendations on LinkedIn, so be sure to ask happy buyers/sellers for endorsements. Yelp: Building your online existence on Yelp can help buyers find you and past clients review you. With some recent photos of you and your properties, as well as basic location information like your address or phone number, your Yelp profile will be ready to go. 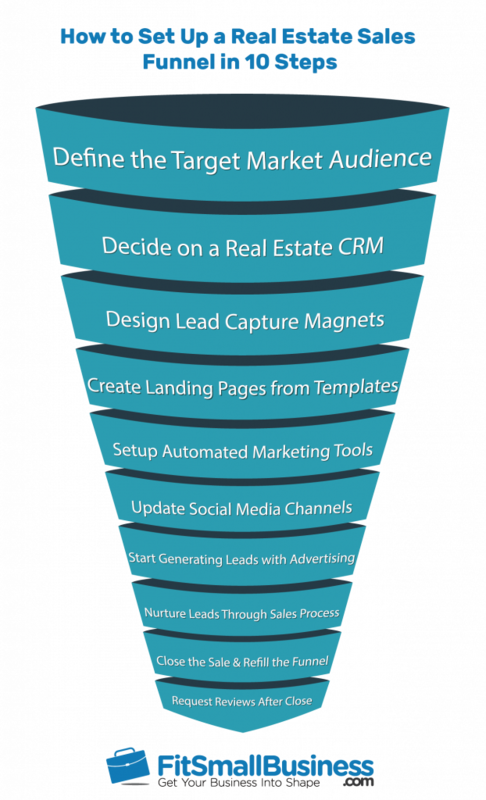 Now that your real estate sales funnel is ready to convert your leads with automated engagement and marketing tools, all you need to do is start filling the funnel with prospects. There are many ways that agents fill their sales funnel with qualified leads; some agents create and manage their own advertising while others use a dedicated service to do it for them. Facebook Ads: Facebook ads are the perfect opportunity to reach a local market with targeted ads to drive traffic to a website. Real Geeks offers a Facebook marketing tool and ad management services so agents can pick the option that works best for their skills, time, and budget. Google AdWords: Google AdWords draws qualified traffic to your landing pages through a series of branded ads aimed at certain keywords and demographics. If you find Google AdWords too complicated or time consuming, BoldLeads is a good choice for agents who do not want to handle their own online advertising. Print Ads/Flyers/Postcards: Print ads might range from placards in shopping carts to property listings in local newspapers. Making sure that your print ads drive traffic to your website is important, and tracking is critical to justifying an expenditure. LionDesk offers Text-2-Sell codes to help with tracking efforts. No matter how good your sales funnel and lead generation systems are at filling the pipeline, you have to be ready to step in and take advantage of new opportunities. This is your time to shine because your CRM has set you up for success with the automated marketing tools you put in place earlier. Appointments: Meeting with potential clients to find out more about their preferences and goals is a vital part of nurturing your leads through the sales funnel. Open Houses: An open house is an ideal opportunity to move groups of contacts through the pipeline because you are exposed to many leads at once. Showing Properties: The opportunity to get a buyer on property is the golden ticket to closing a sale. Returning Communications: You might have to interact through phone calls, emails, or texts to field questions about a property or local area. Closing the sale means getting paid, but refilling the funnel translates to consistent paydays. Every month, you should review the results of your advertising campaigns and look for places to improve your conversions. For example, perhaps one of your lead magnets needs to be updated or a landing page needs to be tweaked to increase flow through traffic. Fresh materials can make all of the difference in refilling the funnel, even for leads that know your brand already. One of the last steps to completing the process of your real estate sales funnel has to be requesting reviews from happy clients. Online social media and reputation management platforms like Yext can give you a high-level view of what people are saying on review sites and an easy way to monitor social media for chatter about you and your agency. Why Are Real Estate Sales Funnels Important? Real estate sales funnels help agents to attract qualified buyers and nurture those leads over time with automated marketing tools to keep contacts engaged in the buying process. How Does a Real Estate Funnel Increase Sales? A real estate sales funnel continues to engage buyers in the sales process through regular, automated communication without increasing the time investment of the agent. Because of this, the agent stays in front of the buyer until they are ready to make a purchase. How Often Do You Need to Review Your Sales Funnel? You should review the conversion rate and materials in your real estate sales funnel at least once a month. You might need to update materials that are not evergreen or tweak things that are not converting well. An effective real estate sales funnel utilizes ads, landing pages, lead magnets, automated marketing, and lead nurturing to convert potential buyers. As part of this process, agents must define their target audience, find the right CRM for leads, carefully design their landing pages, create their lead capture magnets, and set up their marketing tools before starting their social media and advertising efforts. Each of these steps is vital to nurturing the leads through the pipeline and closing the sale. Not enough time to set up your own sales funnel? Real Geeks allows agents to easily create their real estate funnel and generate leads through Facebook advertising and Google AdWords to their IDX website. Find out more about how Real Geeks can streamline the setup and operation of your real estate sales funnel with their demo.